Cover concept and layout by Tomasz Daniłowicz. Behemoth's debut album is really Nergal's show - it's his forceful and aggressive vocals and guitar playing which really make the album work as well as it does. The music presented here is more or less straightforward black metal, but what it lacks in adventurous experimentation or unexpected twist it at least partly makes up for in attitude and delivery. I wouldn't put it in the top tier of black metal albums, and certainly Behemoth would enter more interesting and innovative musical territory once they moved into the sphere of blackened death metal, but it's still an entertaining affair which most black metal fans will enjoy. 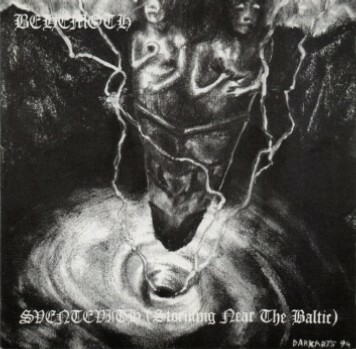 "Sventevith (Storming Near the Baltic)" is the debut full-length studio album by Polish black/death metal act Behemoth. The album was released through Pagan Records in April 1995. The music on the album is, unlike later blackened death metal albums by Behemoth, pure black metal. The vocals are high pitched and raspy and the sound production is thin sounding and not far from murky demo quality. In some cases a raw sound production like that can enhance already raw and savage music, but when the music is as epic and even melodic as it often is on this album, I find it distracting that I can´t enjoy the details in the music because the sound is murky and quite frankly amaturish. That issue aside I´m not totally put off by the album as a whole. The music is as such enjoyable, but not terribly original nor that memorable. There´s good variation in the music though and that´s a plus. You´ll be treated to a lot of acoustic interludes/atmospheric keyboards, and other creative ideas on the tracks to keep them interesting throughout. For all the variation on the album Behemoth are actually best when they let loose and sound really aggressive and simple. 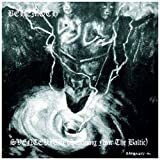 "Sventevith (Storming Near the Baltic)" is a beginning, and while it´s not a terribly impressive or interesting album by Behemoth, it still shows promise. A 2.5 star (50%) rating is warranted. No BEHEMOTH SVENTEVITH (STORMING NEAR THE BALTIC) reviews posted by members yet.